The resignation came despite the passing of a motion of confidence in him in the Dublin parliament yesterday. Speaking on Irish radio earlier, Mr O’Dea said his defamatory comments claiming Sinn Fein councillor Maurice Quinlivan was involved in the operation of a brothel were a “stupid, silly mistake” based on information he had received from a member of the police. This information later turned out to be incorrect, he said. Subsequently, in a sworn affidavit to the High Court in April last year, Mr O’Dea “categorically and emphatically” denied claiming in an interview with a journalist that Mr Quinlivan had a connection with a brothel. However, following the release of a tape of the interview, this was proven to be false. Mr O’Dea said he had been “mistaken” in his High Court affidavit and that he was “not a perjurer.. I did not commit perjury” and suggested that he too was a victim as he was being accused of committing perjury. Mr Quinlivan called for Mr O’Dea to resign, and said a Cabinet minister should not be making damaging remarks about a fellow politician. He said: “The only victim in this is myself. The minister smeared me and he did not get away with it. “If he’s the victim, he’s the victim of his own making.” Mr Quinlivan urged Mr O’Dea to quit his Cabinet post. “I think he should resign. I don’t think it’s acceptable for a Cabinet minister in the midst of a local election campaign to be smearing fellow politicians,” he said. Mr O’Dea paid undisclosed libel damages over the slur, apologised retracted the remark. However, it is his false statement in the High Court affidavit and apparent flauting of perjury laws which is at the centre of calls on him to resign. The Green Parliamentary Party met this afternoon to discuss the controversy following intense criticism of its support for Mr O’Dea in a vote of confidence yesterday. Earlier today, Green Party chairman Dan Boyle issed a brief message on the Twitter and Bebo social networking sites to suggest he was unhappy with his party’s support for Mr O’Dea. He said he thought the Green Party was forced into supporting Fianna Fail in a vote of confidence without being given a chance to properly consider the matter. Reports of internal turmoil within the Greens have increased following the resignation of a party Senator Deirdre de Burca. Ms de Burca, who resigned after she failed to secure a high-profile job at the European Commission alleged the party leadership was desperate to hold onto the perks and priviliges of office in the hugely unpopular coalition government. The Dublin parliament was continually interrupted by attempts by the opposition to discuss the continued presence of Mr O’Dea in the Cabinet. Sinn Fein Dail leader Caoimhghin O Coalain said the government had “further shredded their already tattered credibility” by fully backing Minister O’Dea. Mr O Caolain said Minister O’Dea was “a political animal” and one of the highest vote-getters in the country. In a statement on the Minister’s resignation, Mr O Caolain said the Green Party had “reflected on their public humiliation and had to demand the Minister’s head if they were to stay in Government. “In response the Taoiseach had to seek Minister O’Dea’s resignation. 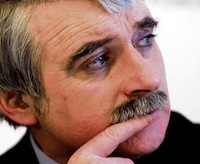 “This dysfunctional and totally discredited Government should follow Willie O’Dea out of office. Fianna Fail, having devastated the Irish economy with their disastrous policies and mismanagement over the past 12 years are now, with the Greens, trying to force ordinary people to pay the price. “In the past six months they have lost a Ceann Comhairle and now a Minister for Defence but these two lay-offs pale into insignificance when compared to the figure of over 436,000 people who are unemployed as a result of Fianna Fail/Green misrule.